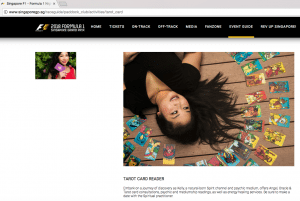 I’m pleased to announce that Kelly, Lightworker is the resident Tarot reader at the F1 SGP 2017! They even gave li’l old me my own webpage! I’ll be giving Tarot readings at the Paddock Club Lifestyle Booths from 15-17 September. See you there!